Still, I wouldn't miss this trip because it's one I looked forward to when I was in high school. I attended my first Interscholastic League Press Conference as a sophomore in 1984. (Don't bother with the calculator; I'm 41.) Now that I'm a journalism adviser, I love seeing my students soak up the journalism vibe and get excited about reporting, photography, design, PR, the works. And best of all, they form those bonds and make memories that they'll remember when they're 41! One thing I'll remember about this trip: It was great to get to see one of our alumni who's now a freshman at UT. She met us for lunch and it was great to catch up. We are SO PROUD of her! 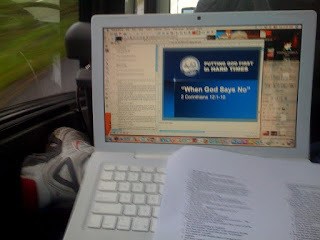 My mobile office: I worked on Powerpoint on the drive down 35. My leg made for an interesting desk. Striking pose: I love the MLK statue on the UT campus. Home, sweet DKR: I walked down to the stadium during one of our breaks on Saturday. Memorial plaque: This war memorial used to be in the north endzone. It's now just outside the stadium. Such a nice tribute. YIKES! UT planted a tree smack-dab in the middle of our tailgating spot! Those people! They act like they OWN the place! ;-) Guess we'll have to figure something out by Sept. 5. Sometimes I complain because this ILPC trip to Austin isn't really like a trip to Austin at all. No time for friends, for Chuy's, for Kerbey Lane. No visits to the Capitol or the Arboretum cows. 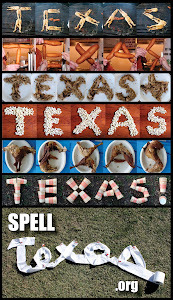 And no Longhorn sports! But I have to admit, it's wonderful to have an excuse to roam the UT campus again.